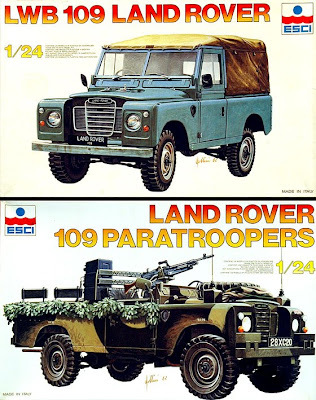 Considering the longevity and worldwide popularity of the Land Rover, there have been surprisingly few model kits of the vehicle. There are diecasts and ready-builts by the dozen, but if you want to glue something together, not a lot. There are kits made in 1:72, 1:76 and 1:35 scales, though these are mostly military vehicles. Heller makes one in 1:43, reissued by Airfix, but when we reach the most popular car scales of 1:24 and 1:25, there’s not a great deal of choice. 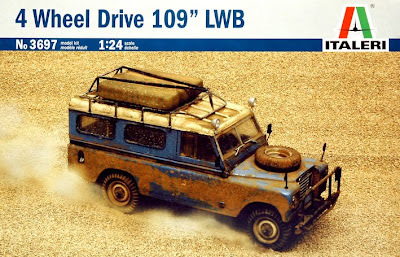 There was an oldish Monogram kit of the short wheelbase (SWB) version, but fortunately the Italian kit company Esci made a long wheelbase (LWB) version to 1:24 scale. This came in three types - soft-top, hard-top/station wagon, and a special paratroop version with suitable army equipment. Sadly, Esci as a kit company has disappeared, but fortunately most of its tooling survives, either with Revell Germany, or now mostly with fellow Italian company Italeri. 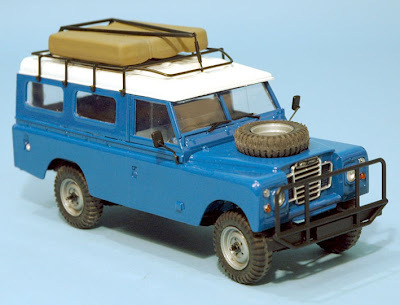 And it is Italeri that has recently reissued the Land Rover station-wagon. Under Esci this was actually an African Safari Land Rover and although the actual designation has disappeared - it’s now simply a ‘109" LWB’ - all the Safari equipment is still there in the box. This includes a full roof rack with unspecified load under a tarpaulin, a ‘nudge’ bar up front, extra lights, and a spare fuel-can to attach to the rear door. There is no opening bonnet or separate engine, but the underside four-wheel drive detail is nicely reproduced. The model has poseable steering, and it can be built in left or right-hand drive versions. The bodywork is slightly different to what you usually expect with a standard car kit, in that the station-wagon top is a separate piece that fits onto the ‘open’ rear body. This is so that the paratroop version could be made, which does not have a top, or even a windscreen. It may be produced by Italeri at a future date. All in all, a nice little kit that fits together well, and a useful addition to the subjects available to 1:24 scale auto model fans. Mat is right to note the age of the Land Rover. The basic design (now marketed as the Defender range) has been around since 1948 - that’s 61 years! 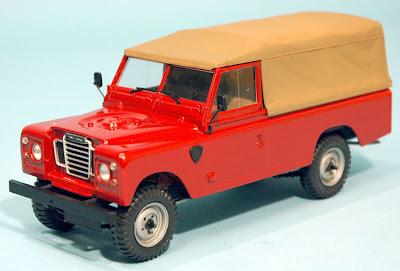 1 The current Italeri Land Rover box, showing a suitably weathered model in a desert setting. 2 The assembled Italeri model, showing Safari equipment. 3 Original Esci boxes for the soft-top and paratroop versions. 4 Esci soft-top Land Rover, with simulated canvas cover. The Italeri 109" LWB Land Rover is available from model stores and online suppliers, including Amazon here. Thanks to The Hobby Company for the review kit.